Syracuse is located at 43°2′49″N 76°8′40″W﻿ / ﻿43.04694°N 76.14444°W (43.046899, -76.144423). It is located about 87 miles (140 km) east of Rochester, 131 miles (210 km) east of Buffalo,and 150 miles (240 km) west of the state capital Albany. It is also the halfway point between New York City and Toronto, about 245 miles (390 km) from each, Toronto to the northwest and NYC to the southeast. ^ Yager, Richard M.; Kappel, William M.; Plummer, L. Niel (May 24, 2007). "Origin of halite brine in the Onondaga Trough near Syracuse, New York State, USA: modeling geochemistry and variable-density flow". Hydrogeology Journal. 15 (7): 1321–1339. doi:10.1007/s10040-007-0186-9. ISSN 1431-2174. ^ "Syracuse University History: History of the Founding of Syracuse University". Archived from the original on September 27, 2011. ^ a b ""Co-ed From the Start: Women Students at Syracuse University in the 19th Century"". Archived from the original on June 9, 2010. ^ "Onondaga Lake cleanup hits milestone this week with completion of barrier wall". syracuse.com. Retrieved October 13, 2016. ^ xmACIS2. NOAA Regional Climate Centers http://xmacis.rcc-acis.org/. Retrieved September 11, 2016. Missing or empty |title= (help) Use "Seasonal Time Series" or "Extremes". ^ "NowData – NOAA Online Weather Data". National Oceanic and Atmospheric Administration. Retrieved March 6, 2018. ^ "Station Name: NY SYRACUSE HANCOCK INTL AP". National Oceanic and Atmospheric Administration. Retrieved March 13, 2014. ^ "WMO Climate Normals for SYRACUSE/HANCOCK INT'L ARPT NY 1961–1990". National Oceanic and Atmospheric Administration. Retrieved March 10, 2014. ^ "OnTheMap". onthemap.ces.census.gov. Retrieved October 13, 2016. ^ "The Syracuse City School District | Syracuse, NY". www.syracusecityschools.com. Retrieved October 13, 2016. ^ a b "The Syracuse City School District | Syracuse, NY". www.syracusecityschools.com. Retrieved October 13, 2016. ^ "Locations | Onondaga County Public Library". www.onlib.org. Retrieved October 13, 2016. ^ "Using Your Library Card | Onondaga County Public Library". www.onlib.org. Retrieved October 13, 2016. ^ "City Libraries | Onondaga County Public Library". www.onlib.org. Retrieved October 13, 2016. ^ "Suburban Libraries | Onondaga County Public Library". www.onlib.org. Retrieved October 13, 2016. ^ "The Monorail Society - 20 Year Anniversary. Part II - Monorail history in TMS's first 20 years". www.monorails.org. Retrieved October 13, 2016. ^ "The Early Years | OCWA". www.ocwa.org. Retrieved October 13, 2016. ^ "Ben Walsh elected Syracuse mayor". syracuse.com. Retrieved March 4, 2018. ^ "Gunfire sensor could help make Syracuse police more efficient, successful". WRVO Public Media. January 16, 2017. Retrieved January 16, 2017. The 2017 mayoral election in Syracuse, New York was held on November 7, 2017, and resulted in the election of Ben Walsh, an independent, to his first term as mayor. Assault City Roller Derby (ACRD) is a women's flat track roller derby league based in Syracuse, New York. Founded in 2007, the league consists of two teams, which compete against teams from other leagues, and is a member of the Women's Flat Track Derby Association (WFTDA). Cycling in Syracuse, New York, has been common on the roads and paths for recreation, commuting, and as a sport since the latter part of the 19th century. During the 1890s bicycling was a new mode of transportation and a popular sport, however, overall bicycle usage declined with the advent of the automobile in the early 20th century. By mid-century, the bicycle was considered a child's toy. Since the 1970s, use of the bicycle for health, fitness and as a non-polluting alternative to the automobile has grown in Syracuse as well as across the United States. By 1895, Syracuse was the "hub" of the bicycle world, at one time, manufacturing as many as 500 machines in a single day. The most popular and wealthiest bicycle manufacturer in the city was E. C. Stearns Company, producer of the popular Yellow Fellow for nearly a decade. This is a list of mayors of Syracuse, New York. This list ranks skyscrapers in the U.S. city of Syracuse, New York, by height. Since its construction in 1927, the State Tower Building has been the tallest building in Syracuse. There has not been a new tall building complete in the city since the 1970s and several projects for tall buildings cancelled before completion. 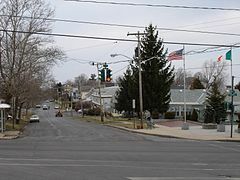 This is a list of the properties and districts listed on the National Register of Historic Places listings in Onondaga County, New York. The locations of National Register properties and districts (at least for all showing latitude and longitude coordinates below) may be seen in a map by clicking on "Map of all coordinates". There are 158 properties and districts listed on the National Register in the county. Of those, 54 are outside the city of Syracuse, and are listed here, while the rest are covered in National Register of Historic Places listings in Syracuse, New York. 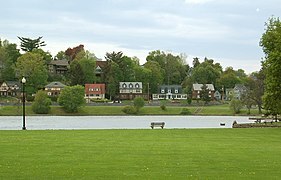 One property, the New York State Barge Canal, spans both the city and the remainder of the county. The War Memorial Arena (originally known as Onondaga County War Memorial) is a multi-purpose arena located in Syracuse, New York. It is part of the Oncenter Complex. Designed by Edgarton and Edgarton and built from 1949 through 1951, the structure is significant as an example of a World War I, World War II and Aroostook War commemorative and as "an early and sophisticated example of single-span thin-shell concrete roof construction." It was listed on the National Register of Historic Places in 1988. The War Memorial has been renovated in 1994 and 2018. The Syracuse Herald-Journal (1925–2001) was an evening newspaper in Syracuse, New York, United States, with roots going back to 1839 when it was named the Western State Journal. The final issue — volume 124, number 37,500 — was published on September 29, 2001. The newspaper's name came from the merger of the Syracuse Herald and the Syracuse Journal. Syracuse IMG Sports Network is the radio and television name for Syracuse University sports. The radio affiliates broadcast football, as well as men's and women's basketball and men's lacrosse games. Time Warner Cable Sports broadcasts the coaches' show and a weekly program titled Syracuse Sidelines.All the aforementioned games are broadcast via the IMG College radio network. Thomas Gold Alvord (December 20, 1810 – October 26, 1897) was an American lawyer, merchant and politician. Throughout his political career he was known as Old Salt. The Toyota Coliseum, formerly the State Fair Coliseum, is an indoor arena in Geddes, New York. It hosted the Syracuse Nationals from 1946 to 1951 as well as the Syracuse Stars of the American Hockey League. It also served as a temporary home to the Syracuse Orange men's basketball team following the burning of their on-campus gymnasium, Archbold Gymnasium, in 1947 until the opening of the Onondaga County War Memorial in 1951. The arena held 7,500 people and was built in 1927. It is owned by the State of New York under the Great New York State Fair. WNTQ, 93Q, is a Mainstream Top 40 station based in Syracuse, New York. The Cumulus Media outlet operates at 93.1 MHz with an ERP of 97,000 watts. WXTL is a classic rock station in Syracuse, New York branded as "The Rebel". It broadcasts on FM frequency 105.9 MHz and is currently under the ownership of Cumulus Media. Cumulus and Educational Media Foundation have entered into an agreement for EMF to purchase WXTL, along with several other stations in other markets, for $103.5 million. EMF will begin operating WXTL upon the sale's closure in the summer of 2019.